Here’s a little video from one of the last times the small group of girls is meeting this semester. 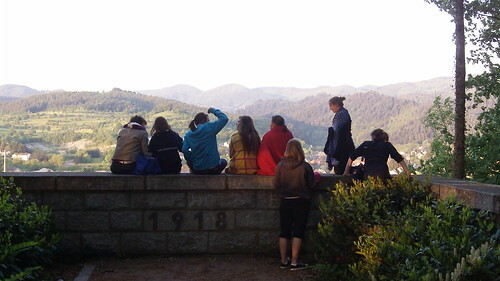 They went to the monument on the hill above Kandern. The other leader, Sue, is leaving after this semester. So she read a letter to the girls she had written them. It was a really good evening of being together and enjoying the outside. Dani’s Small Group from Israel Jernigan on Vimeo. The new website for the school is now officially launched! An announcement was made to the student body before school on Monday. I say it’s about time. Dani and I are excited that it’s live. Dani, because now I will be at home more. 🙂 And myself because now I feel like I have something to show for my time here. There’s still plenty that needs to be done, but it’s a great starting point. And I am hopeful that it will improve BFA’s ability to communicate. Check it out at bfacademy.com. And feel free to let me know what you think. Designed for the weekend before the launch. It's what was shown instead of the homepage. This is the new designed application page. The plan was to make it easier to use and to find the correct applications. The new layout for the news page. This area is being developed, and exciting additions are coming in the next few months. There are now clear sections to feature documents for download. The new and improved staff profile page. Includes easy category viewing and improved readability. A dynamic contact request form. The form has specific links and descriptions depending on the department chosen. There is much more content accessible directly from the website. No more having to download pdfs. There's a new Showcase page that will house galleries and other media related to new media at the school. A much more visual dorm page. And there are some really helpful additions like, date updated and contact information.